Capital and largest city of Spain, Madrid is the physical, cultural and political heart of the country. Upon arrival in Madrid, you will be met by your English-speaking driver and transferred to your four-star hotel, located in the historical section of the city. Set between the Prado, Thyssen-Bornemisza and Reina Sofia museums, the hotel overlooks the remarkable 18th century Fountain of Neptune, in the Plaza de Cánovas del Castillo. Check in and take some time to relax before dinner. This evening, enjoy a tapas dinner in the old quarter followed by a Flamenco performance. Traditionally the music of the Andalucian gypsies in southern Spain, Flamenco has transformed into a style of music and dance that has an entire culture all its own. With plucking guitar strings, stamping feet and snapping fingers, Flamenco is a mysterious form of art which can only be truly understood and appreciated once seen live. 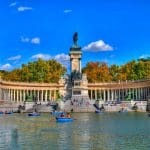 Following breakfast at your hotel this morning, meet your local guide, an art historian, for a half day exploring Madrid. 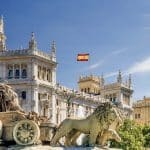 Visit the Museo del Prado featuring one of the world’s largest and finest European art collections dating back to the 12th century, after which you will head to the official residence of the King of Spain at the Palacio Royal, an immense palace richly decorated by artists such as Velázquez, Gasparini and Carvaggio. Before breaking for lunch, enjoy a stroll through the Old Quarter known as Madrid of the “Austrias,” with your guide. Take the afternoon to explore on your own visiting the wide array of markets and shops Madrid has to offer. The most stylish area of the city, Chueca, has chic cafes and independent boutiques. You may want to stop for lunch at the lively La Bardemcilla, owned by the family of film stars Pilar and Javier Bardem. 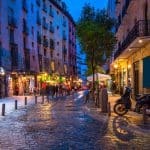 Nearby, the Malasaña neighborhood boasts a young, alternative and artistic scene. Make sure to visit the Plaza Mayor for a coffee and some of the best people watching in Madrid. When ready return back to your hotel to freshen up before dinner. This evening, meet your guide for an insight into how Spaniards dine. You will visit two or three tapas bars. If you haven’t already, try the manchego cheese, gambas al ajillo (shrimp in garlic sauce), or the egg and potato tortilla. This morning, you will meet your guide for a two-hour market tour. Madrid’s busy markets are central to local life, with plenty of charm, and much to see. Your guide will direct you toward the most interesting stalls, where you can browse through a wide variety of clothes, flowers, antiques, local food, and just about anything else you hope to find. When you are ready, meet your driver for transfer to the airport or train station in time for your scheduled departure, or the link to your next Willing Foot experience.